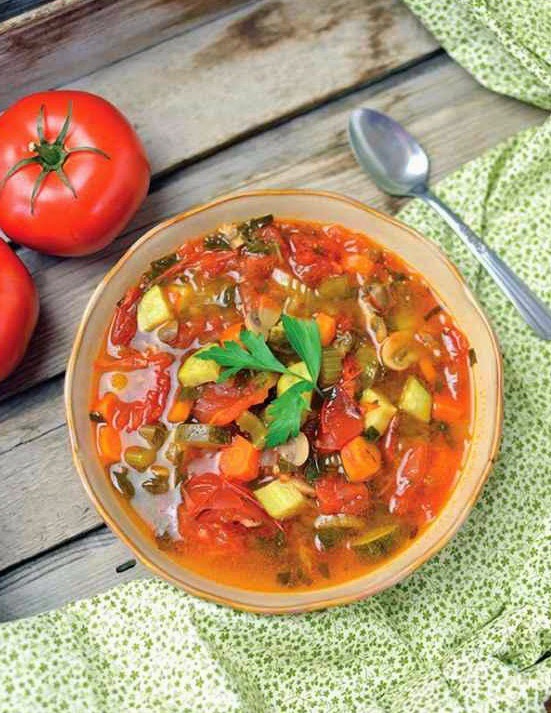 This veggie soup is vibrant, nutrient-dense soup is like a classic minestrone, minus the beans and pasta. Chock full of fresh tomatoes, zucchini, mushrooms, and many other veggies, it’s like a bowlful of summer on a cold winter’s day. Make an extra-large batch while the ingredients are in season during the summer months, and freeze it in mason jars. You’ll get that fresh flavor and nutritional boost that we all miss during those long, gray winter days. If you do plan to freeze it, I recommend using chopped kale instead of spinach. It holds its color and texture better than fragile spinach after freezing and reheating. Oh, and to maximize morning time, chop all your veggies while the tomatoes are in the oven roasting. Everything will go into the slow cooker around the same time, and you’ll be out the door in no time! Wash and dry the tomatoes, and remove the stems. Slice the tomatoes in half, then in half again, making 4 wedges. Place the tomatoes on the baking sheet, drizzle them with olive oil, and sprinkle them with sea salt. Roast the tomatoes in the oven for 20 minutes. Transfer the cooked tomatoes to a slow cooker. Add the carrots, celery, onion, garlic, mushrooms, broth, basil, parsley, bay leaf, sea salt, and pepper to the slow cooker. Cook on low for 4-6 hours. During the last 45 minutes of cooking, add the zucchini and spinach or kale. When the soup is done, remove and discard the bay leaf. Stir the soup to break up the tomatoes, or, if needed, use kitchen scissors to cut the tomatoes into smaller chunks. Enjoy a big bowl of soup or serve alongside your favorite protein. Some spicy thai coconut meatballs goes very well with this!